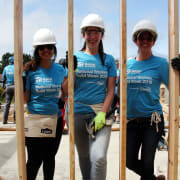 Volunteer with Coos Bay Area Habitat - no experience necessary! Work continues on both our 25th and 26th homes here in Coos County. We hope to help one family move in this month and the other family soon after. But ensuring affordable homeownership relies on the grace of our volunteers and the work they do building hope. Come swing a hammer, plant a tree, paint a wall, or provide a skill we don't even know we need. No experience needed! Work your own schedule. We'll let you know what skill-set we need during a particular week and you decide if you can help. We ask a minimum commitment of two-four hours per shift.